The ultimate demon lord, Astral Trinity, shows up in the form of Arata with a grotesque new appearance. Hijiri appears as well, and the others discover that she is a high-level mage whose goal is to kill Arata and destroy the school. Arata wakes up to Yui and Arin sleeping beside him naked before Lilith comes to his room to wake him up. During physical exercises class, Yui and Arin cling to Arata while he watches the girls doing exercise. Mira and Akio appear, and Mira issues a warning to Yui stating that if she loses control again, Mira will have to take her out. Serina shows up, getting the impression all four of them are fighting over Arata. Lilith and Levi appear, Lilith assuring Arata the girls aren't fighting over him, while Levi gets excited to fight against Akio. Everyone excluding Mira and Lilith activates their Magus Mode, but the fight is cut short as Yui uses her magic and transports everyone to her dream world. Before leaving the dream world, Arata tells Yui he will be her friend, which in turns makes her very happy. Later, Akio and Mira talk about all the breakdown phenomena happening recently. 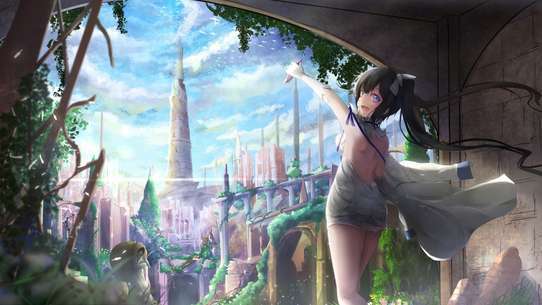 That night, during a thunderstorm, windows in the Academy are broken and a girl is shown smirking, before disappearing. Later that morning, after Mira checked the scene and deduced that the magic was akin to magic regarding an incident of 'that library', Arata begins to inquire information regrading the library Mira mentioned. He then goes to the academy's library to investigate. 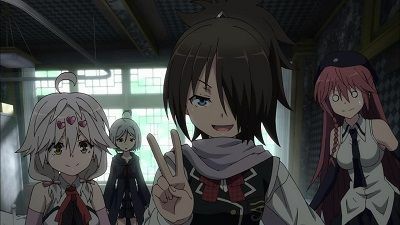 Arata, Selina, and the girls of Trinity Seven are transported to a place which Mira calls the 'eternal library'. 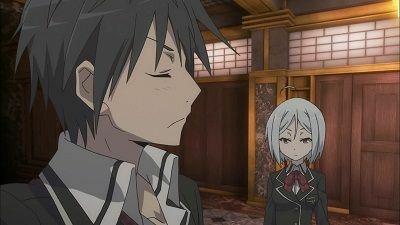 In the eternal library, Lieselotte Sherlock, Serina's older sister and member of the Trinity Seven, appears before the group. She then proceeds to try to get magic power from Lilith and Mira but is quickly stopped by Levi and Akio. Lieselotte explains her motive behind wanting to access the 'eternal library', then explains to Arata that acquiring Demon Lord powers is equal to committing taboo. She then absorbs Selina's magic, becoming a Demon Lord candidate. After Lilith's arrival, Arata discovers that his normal, peaceful life had actually ended three days ago with the Black Sun gravitational phenomenon. He also learns that his current world was created by the grimoire that Hijiri gave him before disappearing, therefore granting his wish. 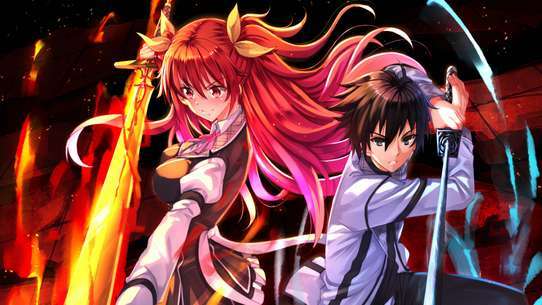 After discovering that Hijiri is alive, Arata decides to become a mage in hopes of saving her. After he enters into the Royal Biblia Academy, he discovers that only those of Demon Lord class mages are able to create worlds. 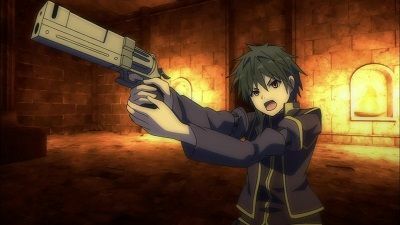 He also found out that in order to save Hijiri, he will need the help of the Trinity Seven. 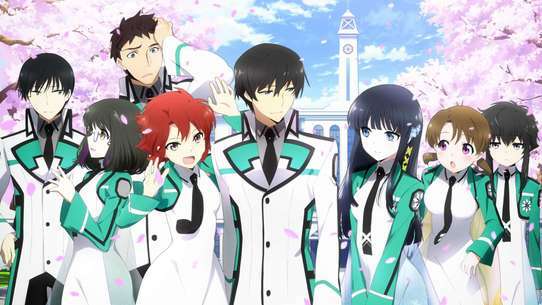 Before all of the students in the academy went to the southern island, it's shown that Yui saved Arata from certain death by dragging him into her dream world. She then proceeds to tell him about magic and the seven archives of magic. She also explained he might able to control his powers by choosing his thema, which is founded in either of the archives. He then proceeds to stop the Breakdown Phenomenon after being released by Yui and choosing his thema. The magic that stopped the Breakdown Phenomenon also caused all the people around him, except Mira, who reflected his magic, to have their clothes dispelled and destroyed. On the island, he showed Serina his new-found magic prowess, breaking her swimsuit in the process. In the hot springs, Arata requested that Lilith demonstrate her magic. She reluctantly accepts it after Arata's constant pleading. After witnessing her spell, Arata requests the grimoire to copy the spell for him, which works out successfully, surprising the entire group. It's the last episode, and Hijiri and Arata have their final showdown. Lugh joins in the fight, along with the Trinity Seven--Lilith, Levi, Arin, Mira, Akio, Yui, and Liese. Why is she attacking Arata? And what secret does Arata hold? Lugh attacks the school while Arata and Mira are being held far away. Yui evacuates everyone in the school into her dream to protect them, and Levi sets out to fight alone. But Lugh is a demon lord candidate who has obtained a demon lord element. 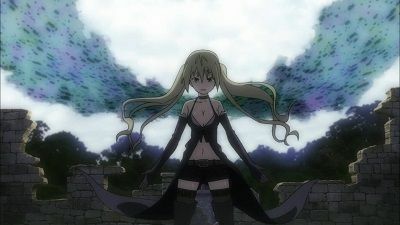 Liese, the last Trinity Seven, appears in the Eternal Library bearing a demon lord seal, making her a demon lord candidate, as well. She tries to entice Arata to join the evil mage side to help save Hijiri, and kisses Arata while he's unsure what to do. 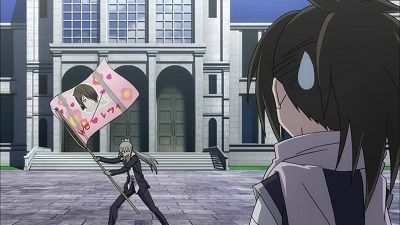 Arata has his magic stolen from him, and Liese decides to attack the school. 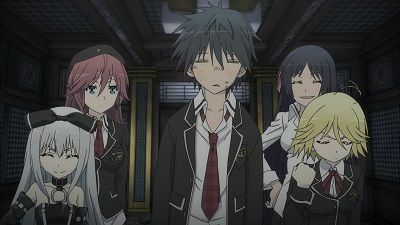 Another Breakdown Phenomenon happens again in the academy, as shown by people with low magical capabilities falling asleep due to the disturbance. Lilith, Arata, Levy, and the Grimoire Security go to see the principle of the academy to figure out the source. 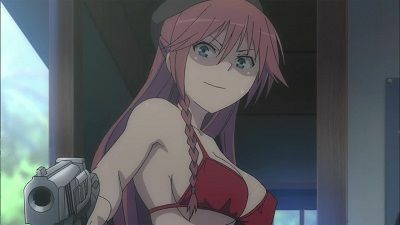 It's learned that the cause of the Breakdown Phenomenon is Yui, a member of the Trinity Seven, losing control of her magic. 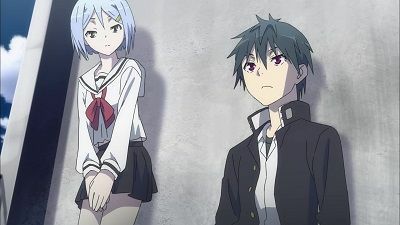 After that, Lilith, Arata and Levy try to catch up with the Grimoire Security as they go to the source of Breakdown Phenomenon, in the academy's dungeon. After Arata, Arin, Lilith and Levi go through the dungeon, they run into Mira and Akio and stop them from advancing. To buy time, Levy challenges Akio to a one-on-one fight, while Arata, Arin and Lilith go on ahead to Yui's room. Arata's magic resonate with the magic of the code D monster found in the room and falls down to his feet. When the Grimoire Security arrived, Lilith and Arin together with the Grimoire Security proceeds on to fight the monster. 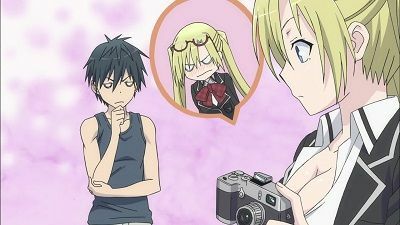 After having a conversation with Levy, Arata is able to properly use the magic that he copied from Lilith to successfully stop the Breakdown Phenomenon caused by Yui. After waking up, Yui immediately hugs Arata and repeatedly shows her affection to him. After Arin following Arata the whole day, he stops her to question what she was doing. Arin told the reason for following him is that she will be the Demon Lord's wife. Serina, Lilith and Levy, together with Arata, were suddenly trapped in his room by a seal placed on the room. While trying to break the seal, all of the girls start having the urge to go to the bathroom, which ensues panic. Running out of ideas, the group tricks the grimoire into telling where the seal was. Arin confesses to placing the seal and explains the reason for trapping Arata and the three girls in the room, before proceeding to use her spells to break the grimoire's control over Arata's power, creating the Black Sun Phenomenon, which is a Breakdown Phenomenon. 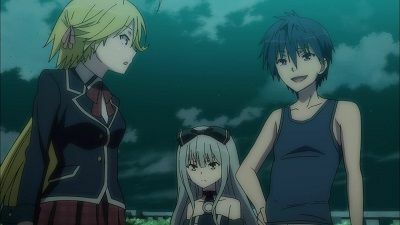 Grimoire Security members Mira and Akio arrive and then proceed to attack Arata after a short conversation after learning he is the cause of the Breakdown Phenomenon.